I am, and my father was before me, a violent Tory of the old school; --Walter Scott's school, that is to say, and Homer's. I name these two out of the numberless great Tory writers, because they were my own two masters. [...] From my own chosen masters, then, Scott and Homer, I learned the Toryism which my best after-thought has only served to confirm. That is to say, a most sincere love of kings, and dislike of everybody who attempted to disobey them. It was probably much happier to live in a small house, and have Warwick Castle to be astonished at, than to live in Warwick Castle and having nothing to be astonished at; but, at all events, it would not make Brunswick Square in the least more pleasantly habitable, to pull Warwick Castle down. And at this day, though I have kind invitations enough to visit America, I could not, even for a couple of months, live in a country so miserable as to possess no castles. The St. George's Company [a guild founded by Ruskin] was founded for the promotion of agricultural instead of town life: and my only hope of prosperity for England, or any other country, in whatever life they lead, is in their discovering and obeying men capable of Kinghood. In fact, I make a similar case in my introduction to a new book, After Modernity? Secularity, Globalization, and the Re-enchantment of the World--though I draw on Tolkien's re-enchantment of the world that borders on a sort of paganism (which any robust theology of creation will flirt with). As Zizek once commented, only a Christian like Tolkien could have created such a wonderfully pagan world. 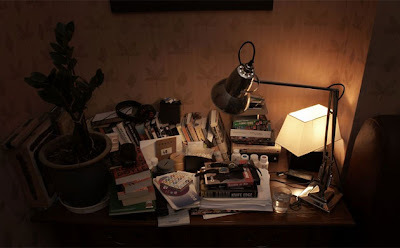 I'm worried that it's a tad voyeuristic, but I just love photographic features like The Guardian's series on "Writer's Rooms." And this past weekend they published a similar piece called "Night Visions" that provided a peek at some famous folks nighstands and bedside tables. Of course, one never knows how artificial these snapshots are, but intriguing nonetheless.